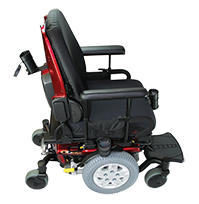 What is the make and model of the powerchair you are fitting with Active Controls? The control module you selected requires an enhanced display to function. How do you plan to mount the display with the chair? On the drive control. On the chair's armrest. We are not aware of any chairs that can have more than 2 lights and actuators on a non-expandable system. Please call 1(800)324-1527 for assistance. What size are the batteries? The MicroPilot is an inductive joystick activated by pressure as apposed to deflection. Because it is fragile, we recommend our silicon ball with spring to protect it durring operation and handling. It also meets FDA requirements for lip mouth control. The Chin Kit is made up of two 'whiskers' - one side is a switch for On/Off, the other is a switch for mode. Also included is a foam ball for interfacing with the chin drive control. The front socket requires the installation of a socket bracket to the chair. The Evaluation Plate allows you to quickly and easily setup a front socket without any modifications to the seatbase. The Evaluation Plate is attached with velcro backing for easy on/off removal of the front socket. I either already have a powerchair at my location that I will install Active Controls on, or I am going to order the powerchair to ship to my location and will perform the installation myself.